I was impressed by Mackie and their lineup of products this year at NAMM. Two in particular for the acoustic artist with the Reach and home recording/podcasting in the Pro DX. Both products give you the ability to setup and play within minutes. The Mackie Reach is an all-in-one PA system for a solo artist or band, karaoke system, boardroom or wherever you need to project the sound. The Reach contains a 4 channel mixer, speaker system with advanced ARC (Amplified Radial Curve) and Ear Shot personal monitors on the sides. If you are a duo, you might put the Reach in-between the performers. The Ear Shot monitors are set on both sides so the artists can hear the music. You can also link Reach systems together if you have it set up conventionally on the sides. 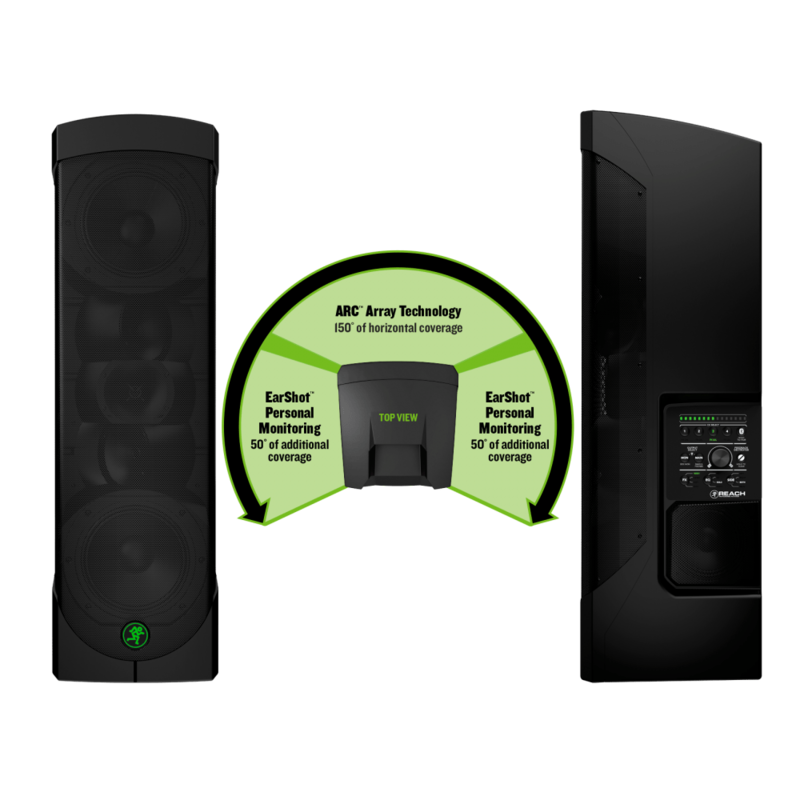 The 28 lb speaker can be controlled at the base or via mobile device using Bluetooth. You have control over volume, EQ and built-in effects using the Mackie Connect App. When setup, you can save it in one of three presets saved on the device. The speaker itself is a 700 Watts of sound consisting of multi-tweeter array and 6.5 inch low frequency drivers. This will splay the sound to a full 150 degrees so people can hear if they are in front of the speaker or to the sides. With the EarShot personal monitor system, you can have 250 degrees of coverage for you and the audience. Mackie also launched their ProDX series of mixers for wireless digital mixing of up to 8 channels. These devices also use a smartphone or tablet to control volume, effects and more. Built with Mackie’s Wide-Z preamp technology, ProDX mixers can plug in and go. They come in 4 or 8 channel versions if you need more or less inputs. 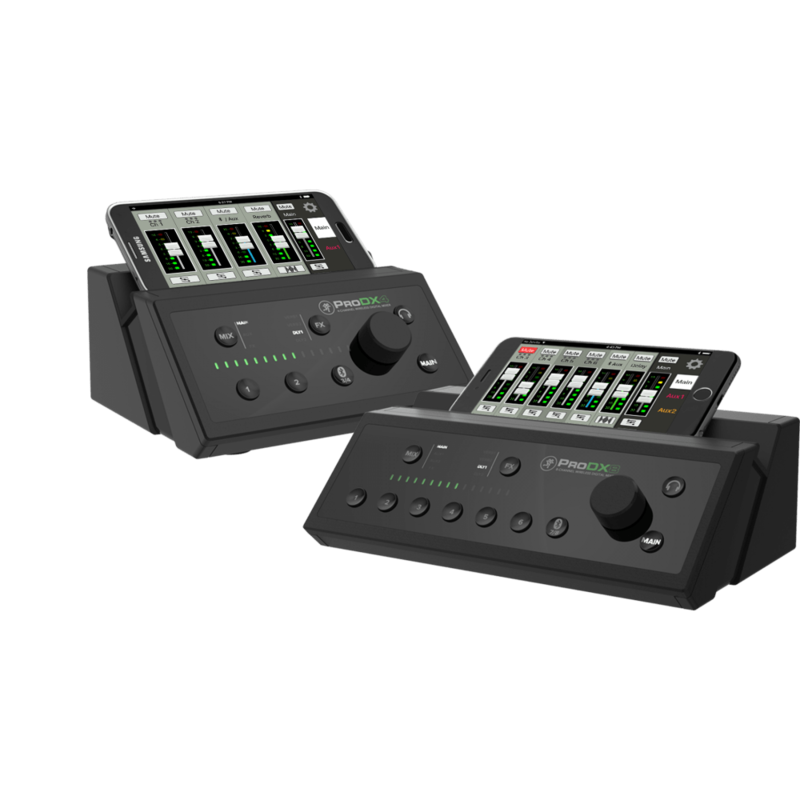 The ProDX4 has a single Auxiliary monitor and the ProDX8 allows for 2 auxiliarry mixes.